The Therma-Pen instant-read thermometer is real. Not cheap, but it will become one of your most important barbecue tools. First off, I do not work for Thermoworks and I am not a sponsor. I just happen to think this is an amazing too for barbecuing! Here's the deal: Do you cut into meat to check it? Do you stab chicken to see if it's done? Or do you just wait until the second beer or margarita is finished or fire engulfs the meat? Slicing into meat while it is cooking is a definite no-no. Juices will run out and the meat will lose taste. 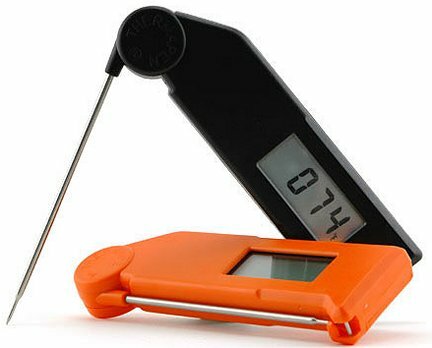 Using a meat thermometer though, lets you cook to the selected temperature and serve juicy meat every time. Meat will be cooked spot-on (i.e.,130 for medium-rare) and guests will be happy. It really is that simple! So if you have not been using an instant-read thermometer while cooking, you really should start now! I've been using meat thermometers for years. Some are hand-held and some are integrated into a battery operated unit. They all register the meat's temperature, but they also have their pros and cons. The hand-held thermometers generally take a while to register, and that's not fun over a hot grill. Integrated thermometers are great, but they only monitor one piece of meat. And then I found out about the Therma-Pen. The greatest meat thermometer made, the Therma-Pen is amazing. I had read about them but refused to buy one because of its cost, $90! I could not imagine how a stupid meat thermometer could in any way be worth that much money. As I read more reviews and comments by backyard and professional pitmasters, my curiosity got the best of me. I finally broke down and bought one via mail order, knowing that I could return it if I didn't like it. There are other "instant-read" thermometers in the market at a cheaper price but none are as quick or as accurate as the Therma-Pen. It is great, it is invaluable and it is with me all the time while cooking. I now check everything I cook with the darned thing. It gives me accurate and instant readings. When I say "instant" I mean within a second. I can check the temperature of a chicken's legs, thighs and breast all within a few seconds. So if you want to improve the doneness of your meats, think about getting one of these tools. It will make a world of difference when you serve your meat properly cooked and juicy.